Hayley Atwell and Tom Burke star in a new adaptation of Ibsen’s play Rosmersholm. The play will be adapted by Duncan Macmillan and directed by Ian Rickson. It will run at the Duke of York’s Theatre in London’s West End from April – July. The Duke of York’s box office is located within the theatre and is open Monday - Saturday: 10am – 8pm. If you have opted for ticket collection then you may do so from the venue on the day of the performance from one hour before the start of the show. In order to be able to collect tickets then you must take the credit card used to make the booking and any reference number with you. The cardholder will be required to sign for the tickets. Originally opening in 1892 as the Trafalgar Square Theatre, the venue was designed by Walter Emden before being renamed the Trafalgar Theatre in 1894 and then to the Duke of York's Theatre in 1895, to honour King George V. A Grade II listed building known for hosting a variety of plays, musicals and operas, the building is now best-known for housing straight plays under the management of ATG. The venue's first ever production was Wedding Eve (1892), with musicals such as Go-Bang (1894), operas such as Madame Butterfly (1900) and world premieres such as JM Barrie's Peter Pan, or The Boy Who Wouldn't Grow Up (1904) gracing the stage. Peter Pan returned to the venue successively each year for the next decade, once starring Noel Coward in 1912. Early productions included The Admirable Crichton (1902) and What Every Woman Knows (1908), London Calling (1923), Easy Virtue (1926) and Home Chat (1927). Following the takeover of the theatre by ATG, the Duke of York's Theatre has hosted high quality productions such as The Rocky Horror Show, as well as successful Royal Court seasons. Notable productions throughout the years have included Journey's End (2004-2005), The Dresser (2005), starring Nicholas Lyndhurst and Julian Glover, Hedda Gabler (2005), Embers (2006), starring Jeremy Irons, Eh Joe (2006), starring Michael Gambon and Tom Stoppard's star-studded Rock 'n' Roll (2006-2007), which included Dominic West and Rufus Sewell. Sheridan Smith starred in Little Shop of Horrors (2007), followed by In Celebration (2007), starring Orlando Bloom. Further productions included Rent Remixed (2007-2008), starring Denise Van Outen, No Man's Land (2008-2009), A View from the Bridge (2009), starring Ken Stott, Ghost Stories (2010-2011), Posh (2012), Jumpy (2012), starring Tamsin Grieg, Constellations (2012-2013), The Judas Kiss (2013), starring Rupert Everett, and Passion Play (2013), starring Zoe Wanamaker. Following these, Hattie Morahan starred in A Doll's House (2013), with Jeeves and Wooster in Perfect Nonsense (2014) scooping the Olivier Award for Best New Comedy. 2015 saw productions of Neville's Island, The Nether, Hay Fever, starring Felicity Kendal, Hetty Feather and Mark Rylance in Farinelli and the King. A West End revival of popular children's tale Goodnight Mr Tom finished off the year, playing in rep with Peppa Pig's Surprise (2016). 2016 saw a revival of The Father transfer to the Duke of York's from Wyndham's Theatre, starring Olivier Award-winner Kenneth Cranham. Game of Thrones star Kit Harington starred in Jamie Lloyd's adaptation of Doctor Faustus, which was followed by popular comedy How the Other Half Loves, which transferred from the Theatre Royal Haymarket, starring Jenny Seagrove. 2016 rounds off with Ken Stott and Reece Shearsmith starring in Ronald Harwood's The Dresser. 2017 began with an acclaimed performance of Ron Harwood's The Dresser, starring Ken Stott and Reece Shearsmith. Further productions included the Olivier Award nominated The Glass Menagerie, starring Cherry Jones and directed by John Tiffany. Olivier Award-winning comedy Our Ladies of Perpetual Succour was next, after a sold-out run at the National Theatre, followed by the Almeida Theatre transfer of James Graham's play Ink, directed by Rupert Goold and starring Bertie Carvel. Robert Icke's Mary Stuart was another Almeida transfer, arriving at the venue in January 2018, starring Juliet Stevenson and Lia Williams. Roger Allam and Nancy Carroll then went on to reprise their roles in The Moderate Soprano, followed by a star-turn from Ian McKellen in King Lear, transferring from Chichester Festival Theatre. The final Almeida transfer of 2018 to grace the stage was Summer and Smoke, a revival of a lesser-known Tennessee Williams play. 2019 will see the National Theatre transfer of Laura Wade's play Home I'm Darling, starring Katherine Parkinson. 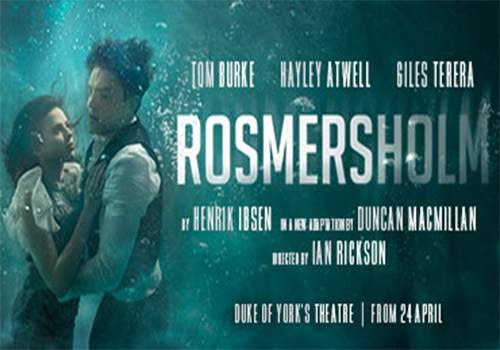 Following this will be Ibsen's play Rosmersholm, starring Hayley Atwell and Tom Burke.